To be anxious about having not enough money to buy food and pay house rent in the next few months is normal to most of us. We are going to panic if the time is a few days ahead and will use money only for food. I do not see these situational anxiety and panic among the Togean people. How do they cope well with the hardship of sustaining life? My neighbor Nursan, 27, has three children; the oldest is 10 years old. As there is no fence between our houses and we often visit each other, I know well their lifestyle. Unless being sick, Nursan leaves home with other five men in a motorboat every afternoon. The boat belongs to their boss in Wakai, the center of the district, one-hour boat. He equips it with an oxygen compressor and simple diving suits, masks, waterproof lights, and spears, but only one tank. They anchor on a number of coral reef spots, as far as two-hour distance from Tangkian. On each spot, they dive, search, and catch/kill anything edible and saleable in the sea. The oxygen tank in the boat is connected to multiple hoses, one for each diver; the hose is vulnerable to being strangled around the corals, and it limits the range of their movement. Furthermore, they have to do it under the low illumination of the light. If they are not careful, the coral or poison animals might injure them. “We used to come home by dawn,” Nursan said, “because we did not go far from Tangkian. Now we have to cruise up two hours to find sizeable fish.” I notice that they are back at home around 8 o’clock every morning. It is not the end of working hours either; two of them have to go to Wakai to deliver the fish box as soon as possible because they have no ice to preserve the fish. As you can see in the photo, the box is not full and most of the fish are small. The payment from the Boss depends on the number, size, and kind of fish caught. On the average, each member of the team (6) receives $5 to $15 for 15 hours on and in the sea—it is bloody freezing diving in the night—depending on the luck. With so meager income and great risk, we think they will use the money for primary needs only. They do not. They all smoke ($2 to $4 per day), and Nursan has a genset runs every evening to power his television set ($4 per night for fuel). He also prefers calling instead of texting me—understandable preference because he did not even finish his primary education, but calling costs him much more. I can easily predict the economic future of the Togean people. They will suffer from the impact of “empty ocean syndrome.” Astonishingly, they do not seem worried about it. 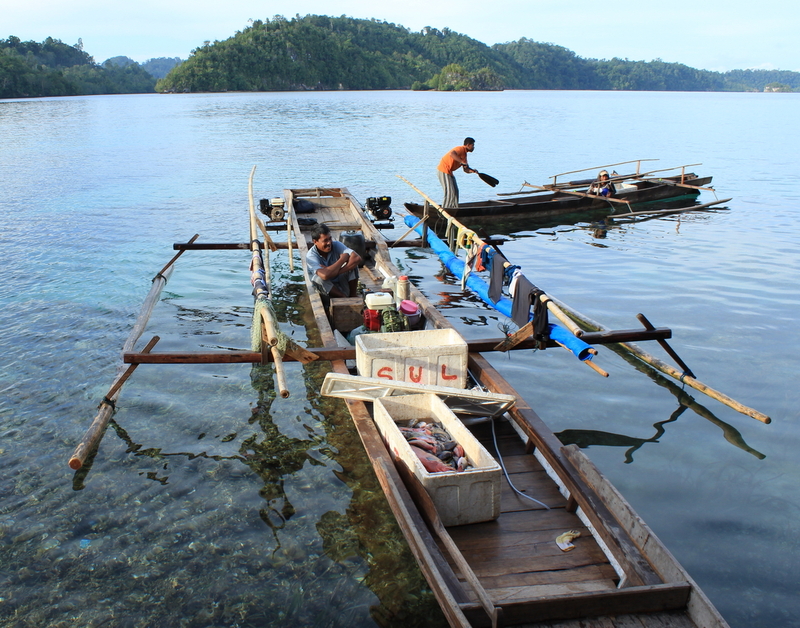 It is a bizarre phenomenon, the attitude of the Togean people compared with the one of the experts on the global climate change and biodiversity loss. Most of the Togeans will lose their islands if the sea level is up more than two meters, but it does not concern them at all. On the other hand, these experts have screamed loudly begging for a huge amount of fund for financing sophisticated research and technology, for arranging high-level meetings, seminars, conferences, workshops, symposium, and trainings, and for paying generously fee of the international consultants. Had the funding been used for creating alternative income generation to Nursan and his folks and to illegal loggers—the people, not the companies—the result would have been tangible.